Late last month, Snapchat revealed its first hardware product, a pair of camera-equipped smart glasses known as Spectacles. Many will compare Spectacles to Google Glass, but I encourage you to resist the urge. While a healthy bit of skepticism is warranted, Spectacles are quite different from Google's high-tech specs; if anything, they are more akin to a GoPro. Spectacles will also only set you back $130 whereas Google Glass cost $1,500. 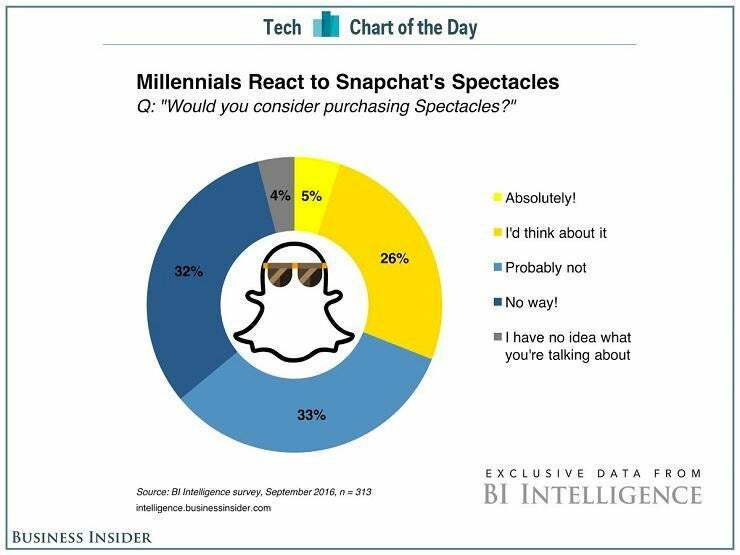 Most importantly, in the eyes of its target demographic, Snapchat -- now known as Snap Inc. as it moves beyond its core app -- is much cooler than Google. In an interview with the Wall Street Journal, Snapchat CEO Evan Spiegel recounted using an early Spectacles prototype during a 2015 hike. "When I got the footage back and watched it, I could see my own memory, through my own eyes -- it was unbelievable," he told the paper. "It's one thing to see images of an experience you had, but it's another thing to have an experience of the experience. It was the closest I'd ever come to feeling like I was there again." Anyone who has used a GoPro understands the value of this statement. Kids record themselves skateboarding, bike riding, hiking, skiing, snowbarding, swimming and more. We may as well rename them The Capture Generation. It's the demographic that Snap understands and, as this chart shows, courts. However, I suspect an older demographic will be interested in Spectacles, too. Boomers are active picture takers and having a real-time video camera on their person would give them more flexibility in what they capture. They also have more travel and leisure time. Personally, I often see interesting things in my travels that I neglect to capture, so having a quick tap-to-record device constantly at the ready would be quite useful. But Spectacles could have a more practical purpose as personal dashcams of sorts. The fixed positions of actual dashcams make them relatively limited. But if I were wearing Spectacles, I'd get a more accurate view of my surroundings. It could even be of use for law enforcement. It can be difficult to predict how a specific piece of hardware will perform in the market. That being said, the concept is sound and having a capture device that looks like something most of us already wear -- sunglasses -- and less like, well, Google Glass, is a good first step. You can bet that other companies will follow with more stylish alternatives or team with Snap Inc. on various design options. Still, hardware is hard. Snap Inc. will need to pull together a polished team before we take Spectacles more seriously.